CoDE Pod Hostels - THE LoFT i Edinburgh, Skotland: Reservér nu! 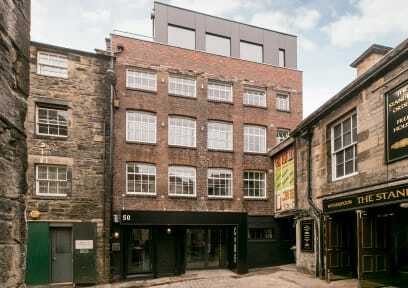 CoDE Pod Hostels - THE LoFT is a unique, boutique hostel on Rose street North lane, in the vibrant and beautiful city centre of Edinburgh. We are located within walking distance of most major sights and we are conveniently located on connections from and to the airport. The train and bus station are just a few minutes by foot from our hostel. 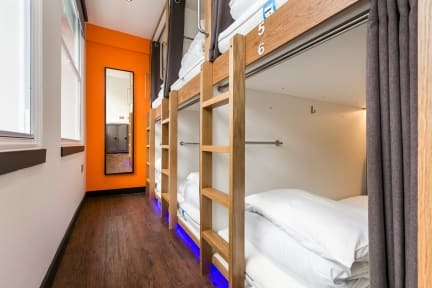 Combining innovative, modern design with the traditional materials and elegance of a listed red brick building, CoDE Pod Hostels aim to provide the best possible accommodation, atmosphere and experience for our guests. Our sophisticated ‘Pods’ (we’ve gone beyond traditional bunk beds here) are designed with maximum comfort and privacy in mind. Our kitchen and communal area are intelligently laid out to ensure those who stay here can relax and unwind, and, if they choose to do so, meet and mingle with interesting new people, as part of their hostel experience. Our penthouse apartment is our luxury private room with double bed. It is designed with its own kitchen, private bathroom and roof terrace with views of the castle. The big windows make this a bright room with views over the roofs of Edinburgh. We offer a healthy breakfast every morning from 8:00 am until 10:00 am for £3 if pre-booked or at check-in. We are also surrounded by a large collection of breakfast and dining choices to suit all budgets and tastes. THE LoFT is a fun, cool, relaxing place to stay and is the perfect location from which to explore and enjoy everything that Edinburgh has to offer. Check out what people are saying about us online – or come see for yourself!! Hope to see you at CoDE Pod Hostels! Cancellation policy: We have a 3-day cancellation policy. For cancellations within this period, 100% of the stay will be charged. Our reception hours are 8AM-8PM. This hostel was very unique, the beds aka pods were like no other hostel I have stayed in before. They were quiet spacious...and comfortable, as well very private. I would definitely recommend this hostel to anyone who passes by. Staff was friendly and the free breakfast was the best hostel breakfast I have had in awhile.